In a form for this table, I’m trying to create a combo box in RELN that uses the value in Location in that same record as criteria to filter choices in the combo box whose source is a different table (called IMCELN) which also contains a field “Location.” I’m trying to match the Location value in the current record of IPOrphans with the Location value in IMCELN to give me a list of choices. This list is a subset of IMCELN. 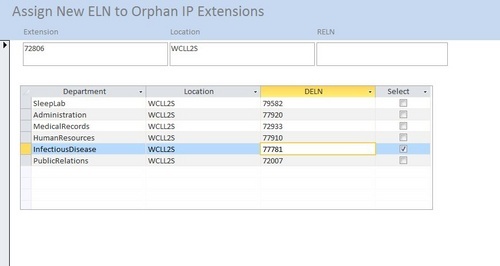 I want, if possible, the combo box in IPOrphans form to have at its source a query which uses the Location field of the same record (Value: WCLL2S) as criteria to return only the records for Infectious Disease and Public Relations. I have searched for a solution for this and come close, but I just can’t get the statement right. Sometimes it comes up asking for IPOrphans.Location (which, if I enter “WCLL2S” will give me the choices I want. I just want it to use the Location field in that record to supply that. Otherwise it uses that value as criteria for the rest of the records. If the table relations are set correctly you should be able to do this with a parent/subform arrangement; however, as you are looking that the comboxes, you might take a look thru the following articles on filtering. [Control Source] = is the field in a table that the combo/list-box control will read/write the data within the database. [Row Source] = this is the information that is displayed in the control. It can be a value list, linked to a table/query, or have the SQL embedded within the property. which is why I think the Cascaded Form Filtering article is the closest match. If you don't follow the article, post back here and we'll follow up on it. I looked at the Cascaded Form Filtering article but didn't find it to be exactly what I needed (as far as I could understand it... maybe I'll study it a little more). I know I worded this very awkwardly, so thanks for your reply anyway. BTW, I have to get the correct DELN value in the subform into the RELN field in the parent form. I'm not sure your database is normalizedwhich will make your life very difficult; however, not really sure from what you've provided; however, you shouldn't be storing information twice. Please forgive me today, there's an event this weekend that I co-chair for my Church otherwise I'd put a simple example together for you. The trick here, is that in the after_update event of the control acting as the parameter, you have to force the combobox to update it's rowsource, because it only takes a picture. You're basically doing the parent-child, just in a combobox and feeding the table field shown in the control source directly the value of the cbo's bound column. Either EOF or BOF is true, or the current record has been deleted. How to create a record using data from another table?